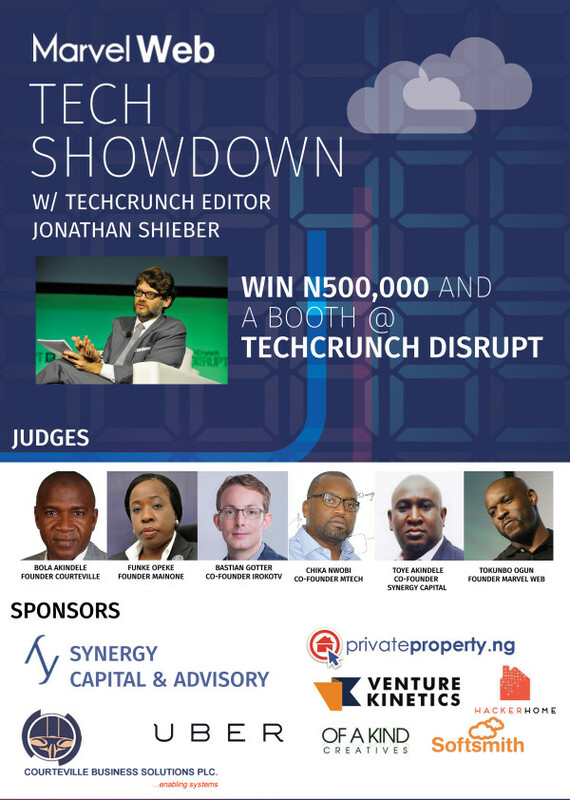 Marvel Web is hosting Tech Showdown with Techcrunch.com editor Jon Shieber in Lagos during the last week of July 2015 and we’re looking for a few good startups to pitch at the event. The goal is to bring the community together, get to know the amazing tech entrepreneurs in Nigeria, and get the word out about cool local startups to the international tech community.We’re hosting a Pitch-Off, where pre-selected companies will have exactly 120 seconds to pitch their product on stage to a panel of judges, including TechCrunch editor Jon Shieber, local venture capitalists, and successful startup entrepreneurs. In the end, only 3 startups will be victorious.Because this is Lagos, we have to raise the bar in terms of prizes for our winners, so in addition to the prizes listed below we’re throwing in a lot of extras. The video is required so that we have an opportunity to see your team present. Do not worry about production quality, camera phones are more than enough. The important thing is that you keep your pitch under 2 mins. Any pitches over 2 mins will not be considered. Do not include any graphics. The goal of your pitch is to get us excited enough to ask followup questions.